The designer of the Media Jacket presents a new product. The Media Waistcoat, well conceived, also to complement the Media Jacket from the work clothes range, as a universal outdoor waistcoat. Hamburg designer, Heike Hüning, has on top of the Media Jacket designed a further piece of practical, weatherproof clothing that caters to event technicians, production teams, film, television, and radio directors, actors, photographers, journalists, and security personnel in equal measures, and greatly aids them in their work by means of its numerous functional design details. The waistcoat consists of WINDSTOPPER® materials that offer climatic comfort and equal protection against wind and weather. The waistcoat is made from WINDSTOPPER ® Soft Shell, which is breathable and at the same time water-repellent. The pockets consist of a material that is waterproof, in order to protect the equipment. So that this remains dry, the pockets are partly separable by means of adjustable pushbuttons. These can in high-summer weather be practically and quickly attached to a belt. Mobile phones, sun glasses, Palm handhelds, IDs, documents, and technical equipment have no problem finding a place in the various pockets. Extras are a call-sheet clip, a pens’ holder, pockets for film containers etc. The walkie-talkie pocket on the left breast complements the Media Jacket and is fastened to it with pushbuttons. The materials and trimmings are specifically chosen so that nothing reflects or rustles during shooting. A robust material is used for the shoulder area. On the back is affixed a strap furnished with pushbuttons that can be individually printed on or embroidered. The waistcoat is of course also suitable for different outdoor activities. 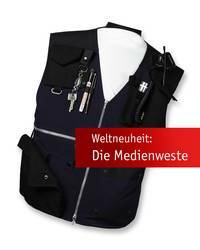 Are you interested in the Media Waistcoat?